You may not expect to read about multiple amp loads in the context of “Low Power Design”. It could be an indication of how wide-spread the push for energy efficient products has become. In many embedded applications it is quite common for a micro drawing a few milliamps to control motors or solenoids that require several amps of current or high-brightness LEDs that draw several hundred milliamps. Even if these current ranges are way above what your design has to deal with, the information presented here may be applicable to your design. You already selected the lowest RDSon FET you could find but are you taking full advantage of its capabilities? Make sure your gate voltage is such that the FET is fully turned on and operating in its lowest RDSon range. Most N-channel FETs usually need a gate voltage in the 8-10V range to fully turn on so simply driving the gate with a GPIO won’t put the FET in its lowest RDSon range. Logic level gate FETs may be better in this regard but typically they just have a lower minimum turn-on threshold and may still need over 5V to fully turn on. In these cases you should consider using a P-channel FET or even a gate driver IC to drive the gate of the N-channel FET with the voltage it is switching (or use a step-up regulator or voltage doubler circuit to provide a higher voltage if the input voltage exceeds the maximum gate voltage). The graph below shows the impact of gate voltage on Rds(on) for the Fairchild FDS8449 N-channel FET. The FDS8449 has a max gate turn-on threshold of 3V but as you can see at 3V the Rds(on) is 2.4X higher than at 10V at no load, much higher as the load increases. When using a P-channel FET to drive a load, a GPIO may not drive the gate high enough to completely turn off the FET so you may be leaking power through the FET. This can often go un-noticed since the amount of power is too low to activate the load. Using an open-collector driver or an N-channel FET to drive the gate of the P-channel FET can solve this problem (don’t forget a pull-up resistor from the P-channel FET’s gate to the voltage being switched). A P-channel FET of similar rated voltage and current as an N-channel FET will typically have 50-100% higher Rds(on) than the N-channel FET. With Rds(on) specs on modern FETs in the double-digit milliohm range even doubling the Rds(on) produces a fairly low value. However, that is simply wasted power that can easily be eliminated if low-side switching is an option for your application. This is also important to keep in mind if for some reason you can’t address one of the issues discussed here that prevents the FET from operating close to it’s lowest Rds(on), changing the type of FET may alleviate the problem. If you have a P-channel FET operating at 2X its lowest Rds(on) then you could possibly reduce the Rds(on) by a factor of 4X by using an N-channel FET. Just like a resistor, the Rds(on) of a FET increases with temperature. The graph below shows the impact of temperature on Rds(on) for the Fairchild FDS8449 N-channel FET. As you can see, a 50°C increase in temperature results in a nearly 20% increase in Rds(on). Even if your product is normally used in a room temperature environment, a 20-50°C temperature rise at the FET’s die isn’t uncommon (another reason to operate the FET in its lowest Rds(on) range). This is another situation where keeping a part cooler helps prevent wasting power, as the Rds(on) increases the part will get hotter, increasing the Rds(on) and so on. A hot FET and a non-optimal gate voltage can combine to generate a lot of excess heat and waste a lot of power. Similar to LEDs, electromechanical devices can often be driven with a PWM to reduce power without impacting the performance of the device. Solenoids can often be “kicked” with a several hundred millisecond pulse to actuate them and then driven at as low as 30 or 40% duty cycle to keep them actuated. Depending on size, a DC motor may require a “kick” for up to a few seconds to get it up to speed and more than a 50% duty cycle to avoid slowing down but with such large loads, even a 10-20% savings can be a considerable reduction in power consumption. If your application involves high currents or other potential heat sources, consider buying or renting an infrared thermal camera. The camera will help you find hot spots on your board and access the effectiveness of your heat spreading/isolation efforts. Don’t be tempted to skimp and use a laser pointer IR thermometer instead of the camera. The IR thermometer has a fairly narrow range of view and only displays the temperature where you point it. An IR thermometer may not accurately measure the temperature of a small hot spot like one caused by high current flowing through a small surface mount FET. The beauty and value of the camera is it can show you even tiny hotspots where you don’t think about looking for them. The first time I used a thermal camera it did just that, allowing us to fix an issue at the prototype stage that would have likely lead to field failures and high warranty costs. That camera more than paid for itself in a matter of hours. This entry was posted in Hardware and tagged gate driver, MOSFET, PWM, Rds(on), thermal design on June 23, 2015 by Mike. Virtually all semiconductor devices have some amount of leakage current. It is interesting to note as operating voltages and device power consumption keep dropping, leakage current is becoming a larger percentage of a device’s power consumption. In most cases there isn’t much you can do about leakage currents other than be aware of them and account for them in your power analysis. In some cases there may be a significant difference in leakage current levels from manufacturer to manufacturer for devices that perform the same function so it pays to take the time to include leakage current comparison in your component selection. For a CMOS device that isn’t actively being clocked, leakage current can make up a significant part of its power consumption that may be called out as “standby current” or “quiescent state current” in the datasheet specs. Diodes (including LEDs) are one a few types of devices where the circuit design can play a part in determining the extent of the leakage current in that design. Diodes can present substantial leakage currents when in a reverse voltage condition, this is often referred to as reverse current. Similar to capacitors, there are a number of factors that come into play in determining the level of leakage current. Unlike capacitors, there aren’t any simple formulas to help you estimate what the reverse current is for a diode. Diode reverse current varies considerably from device to device and isn’t necessarily dependent on voltage rating, current rating or physical size. 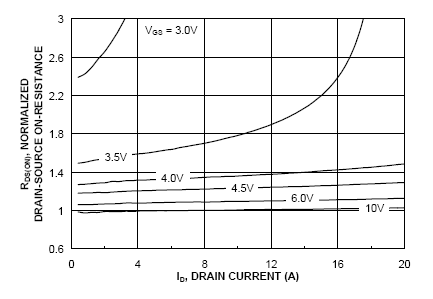 The graph below shows a typical diode voltage/current curve. Notice that under forward voltage conditions (blue shaded area) diodes conduct very little current until the voltage starts approaching the diode’s forward voltage. Although not technically a leakage current, current will start flowing at a few hundred millivolts below the forward voltage level where the diode is expected to “turn on” and start conducting. Under reverse voltage conditions (pink shaded area), some amount of leakage current occurs as soon as the voltage is reversed and increases as the reverse voltage increases. Note that this graph is not to scale, the forward voltage of a diode is typically less than one volt while the reverse voltage and breakdown voltage are usually tens to hundreds of volts. Schottky diodes tend to have higher reverse currents than standard diodes. In a recent search on DigiKey, for SMT Schottky diodes the reverse current specs ranged from 100nA to 15mA while for standard diodes the range was nearly an order of magnitude lower, from 500pA to 1.5mA. A Schottky diode may be appropriate for your design because of its low forward voltage but be aware that its leakage current can be considerable. 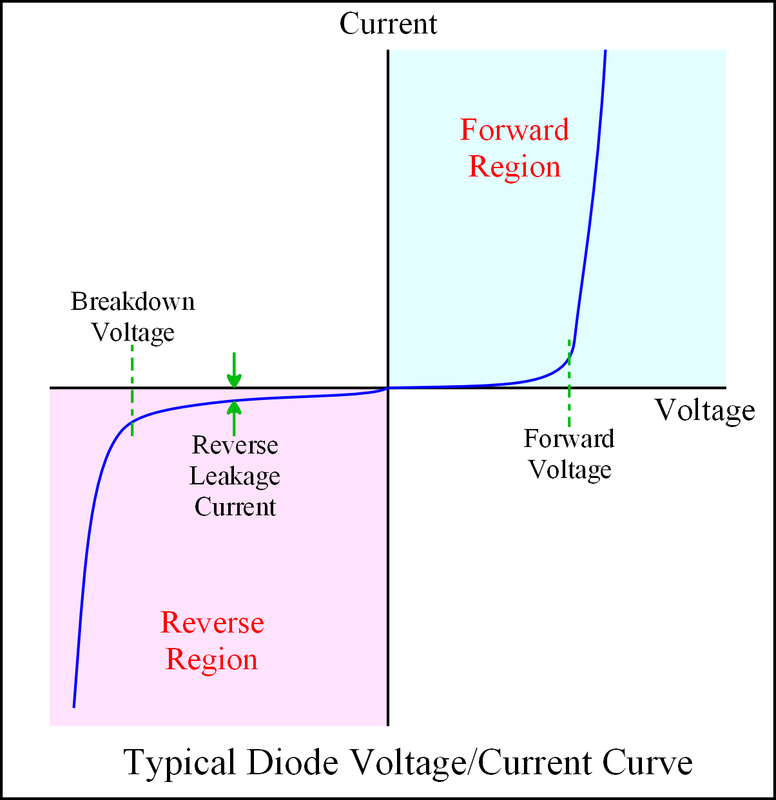 Similar to leakage current for caps, the applied voltage relative to the rated reverse voltage can have a significant impact on the reverse current of diodes. Reductions in reverse current as the applied voltage is reduced relative to the rated reverse voltage aren’t quite linear but can reach 90% or more. This is often shown in a graph in the diode data sheet with reverse current plotted against percent of rated reverse voltage. 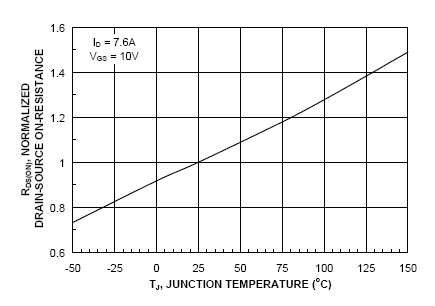 Temperature will also have a significant impact on a diode’s reverse current. It is not uncommon for a 20°C temperature increase to cause a 10X or greater increase in reverse current. One option to improve this situation in power application where a diode can heat up while operating is to utilize a physically larger device and large copper areas on the circuit board to help transfer heat out of the diode and into the circuit board. As shown above, the reverse current can become significant as the breakdown voltage is approached and increase to many times the rated current of the device if the breakdown voltage is exceeded. This is referred to as “avalanche current” because of the sudden increase and is the point where the part is likely to be destroyed. Reverse voltage with an LED typically is not a problem unless there are multiple power rails in a design and the cathode is driven to a higher voltage than the anode when the LED is off. 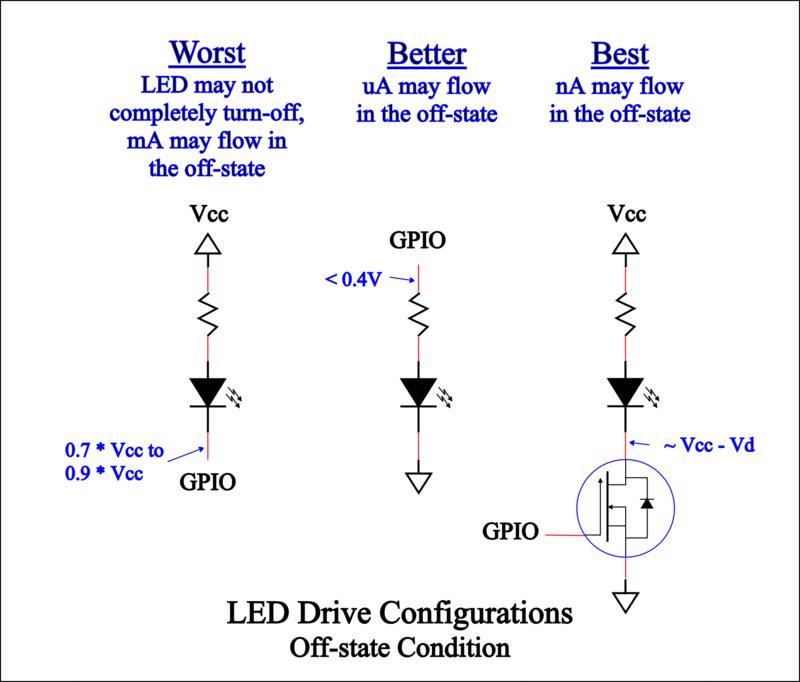 It can be tempting to use a high-drive GPIO to directly control an LED as shown in the diagram below. Because of the typical logic “high” and “low” levels of a CMOS micro, this can still result in hundreds of millivolts across the LED when it is off. This will create the condition just to the left of the “Forward Voltage” point on the voltage/current curve where there may be from tens of microamps to a few milliamps of current flow through the LED. If you choose to use a GPIO for cost/space reasons, it is better to connect the GPIO to the anode side and drive it high to turn on the LED. A CMOS micro will usually have a low level output below 0.4V while the high level can be as low as 70% of the Vcc rail. If you connect the GPIO to the cathode, at 70% of 3.3V that is only 2.3V which may not even be high enough to turn the LED completely off. To virtually eliminate the current flow through an LED in the off state, use an N-channel MOSFET to control the cathode of the LED (see diagram below). This allows the cathode to float so the only current paths available are the circuit board itself and the solder mask (typically 100M ohm or higher) and the leakage current path through the MOSFET (typically in the low nanoamp range for a small N-channel FET but it can vary). Keep in mind that with current requirements of minimally several milliamps, an LED can draw much more current than a sleeping or slow running micro and high brightness LEDs can draw more current than a Bluetooth or ZigBee radio uses when transmitting. Think about how bright your LEDs really need to be. Really bright LEDs generally aren’t needed unless a device is used outdoors or needs to be visible from across a large room. Light pipes and similar low cost plastic optics can be very useful for making an LED appear to be brighter or larger and may allow you to decrease the LED current by several milliamps. Particularly in red and green, high efficiency LEDS are available today that provide much better brightness/power performance than older LEDs. When using an LED as an on/off indicator, consider a slow flash of the LED instead of having it on constantly. Turning the LED on for ½ second every 3 seconds provides an almost 84% reduction in the power used for this indicator. On a much smaller time scale, use a PWM to control the on/off duty cycle of the LED. LEDs tend to stay lit for a relatively long time after they are turned off. Switching the LED on/off with a 50/50 duty cycle at a rate faster than 1Khz will cut the power by half with an imperceptible reduction in brightness. The timers on many modern micros have PWM outputs or other output modes that can be used for this with little to no involvement by the firmware other than starting or stopping the timer. If your device has more than a few LEDs that can be on simultaneously, consider adding an ambient light sensor to your product and controlling a PWM to adjust the brightness based on ambient light conditions. Up to this point I have covered leakage currents, currents that may not be obvious but are usually specified in part data sheets. This part will deal with “current leaks”, non-obvious current flows and power losses that are caused by the circuit design. In some cases these “current leaks” may be reduced or managed somehow, in other cases you just need to be aware of them so they can be accounted for in your power budget. The efficiency of a MOSFET is a function of gate voltage and load current. Most N-channel FETs usually need a gate voltage in the 8-10V range to fully turn on so simply driving the gate with a GPIO won’t put the FET in its lowest RDS(on) range. Logic level gate FETs may be better in this regard but typically they just have a lower minimum turn-on threshold and may still need over 5V to achieve their RDS(on) spec. In these cases you should consider using a P-channel FET or even a gate driver IC to drive the gate of the N-channel FET with the voltage it is switching (or use a step-up regulator or voltage doubler circuit to provide a higher voltage if the input voltage exceeds the maximum gate voltage). The graph below shows the impact of gate voltage on Rds(on) for the Fairchild FDS8449 N-channel FET. The FDS8449 has a max gate turn-on threshold of 3V but as you can see at 3V the Rds(on) is about 2.4X higher than at 10V at no load, much higher as the load increases. When using a P-channel FET to drive a load, a GPIO may not drive the gate high enough to completely turn off the FET so you may be leaking power through the FET. This can often go un-noticed since the amount of power is too low to activate the load. A P-channel FET of similar rated voltage and current as an N-channel FET will typically have 50-100% higher Rds(on) than the N-channel FET. With Rds(on) specs on modern FETs in the double-digit milliohm range even doubling the Rds(on) produces a fairly low value. However, that is simply wasted power that can easily be eliminated if low-side switching is an option for your application. This is also important to keep in mind if for some reason you can’t address one of the issues discussed here that prevents the FET from operating close to its lowest Rds(on), changing the type of FET may alleviate the problem. If you have a P-channel FET operating at 2X its lowest Rds(on) then you could possibly reduce the Rds(on) by a factor of 4X by using an N-channel FET. Just like a resistor, the Rds(on) of a FET increases with temperature. The graph below shows the impact of temperature on Rds(on) for the Fairchild FDS8449 N-channel FET. As you can see, a 50°C increase in temperature results in a nearly 20% increase in Rds(on). Even if your product is normally used in a room temperature environment, a 20-50°C temperature rise at the FET’s die isn’t uncommon (another reason to operate the FET in its lowest Rds(on) range). This is another situation where keeping a part cooler helps prevent wasting power, as the Rds(on) increases the part will get hotter, increasing the Rds(on) and so on. Thermal runaway isn’t likely to happen but a hot FET and a non-optimal gate voltage can combine to generate a lot of excess heat and waste a lot of power. This started out to be a 2 part article, next week I’ll cover more sources of power loss commonly found in circuit designs to wrap-up the 3rd and final part. This entry was posted in Firmware, Hardware and tagged diode, leakage current, LED, MOSFET, Rds(on), reverse current on May 19, 2015 by Mike.